After a 25 year wait, I've finally bagged one. Congrats! Does that give you a complete set? Was that the Moderne that was on Ebay and ended on 15th of January? Anyway: Welcome to the club. You'll find out that it maybe an ugly ducklin' in the pool of Ibanez beauties (could discuss this for hours, maybe another thread??) but it's a hell of a guitar. I own a '77, original and it's one of the top-pieces in my Ibanez collection, besides the V, the Explorer and the plexi Dan Armstrong. Enjoy this pretty rare bird! No not quite. I'd love all 3 but just ain't got the room for them. You're a keen eyed ebayer my friend. I came to an agreement with the seller after the auction ended as his reserve wasn't met. You could say that good things come to those who wait. "But the Ibanez is a copy" he sezz. Ah, but in the case of the Moderne, it's not really a copy, is it? I believe Gibson only produced a handful of them as prototypes. The original Gibs had that awful headstock with the gaggle of string trees. The Ibanez version is a refinement in my book. Yes I agree entirely. I didn't want to go into massive detail about the mystique of the Gibson version earlier. There is no hard evidence to suggest that anyone owns or, has owned an original 58� Moderne. Shipping totals show up for the guitar but putting other strange and wonderful theories aside, the general thought is that most of these guitars were destroyed at the factory and never actually got shipped. To my knowledge, over the past 40 odd years Ibanez are the only big shot manufacturer to release a copy of the Moderne. As usual, I use the term �copy� lightly purely from the viewpoint that few eyes (if any) have ever seen an original so the Ibanez is a bit of a one-off really. As far a refinement goes, I think Ibanez made an educated guess back in the 70�s about the control layout and scratch plate as there were no plans, sketches or photographs of an original to refer to. As for the headstock, God knows what they were thinking there. I know the standard Les Paul headstock works great but COME ON GUYS! Also check out Tom Wheelers book, where you will find a picture of a Moderne. I don�t know about you but that looks remarkably like a lashed up Ibanez guitar to my eyes. Also check out the Les Paul Forum for discussion on the original Moderne. Not that I want to drag anyone away from here John. I bet John Entwistle had one. The original guitar by Gibson was the Moderne. Possibly only one made it out of the factory. The reissue in the early '80's was not a faithful reproduction as it used the standard Les Paul type headstock. The Ibanez version (model 2469) is called the Futurist. Since Ibanez used their own headstock design (Artist castle), legally and technically, it's not a copy! 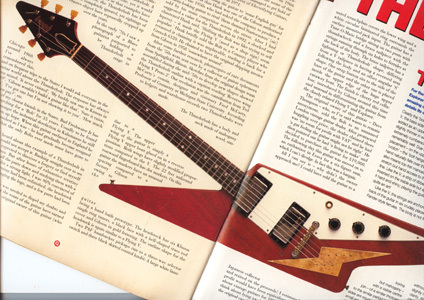 The original Gibson Futura was basically an Explorer with a "V" shaped headstock. The later Futura reissue had a strange part-Flying Vee/part-Explorer/part-Moderne body. One ugly muther!! I don't see an Artist Castle headstock, rather the Gibson Open Book. Hmm... I think I need to get my eyes checked! As far as I know Ibanez "Moderns" are copies of the original Gibson design, but for the headstock. In the early eighties Gibson made the Modern, but with a smaller scratchplate (controls mounted directly on the body) but with the original headstock, including all the string guiders. But yes, Ibanez was the first to launch this type of guitar commercially. Some of the early ones have the open book head, which -as we know- was changed to the "Guild" shape in 1976. Here's an Antoria version if anyone is interested. I for some reason, is also attracted to the Korina Trio ie the Moderne, V and Explorer. According to eye witness reports, Gibson did display a prototype at a trade show when it was first launched. It was then thought that because of the poor response they were probably destroyed in the factory shortly after that. Six, the pic that was shown in Tom Wheeler's book may be the real one after all. In that book, it mentioned that it had gone through some lawsuits and that George Gruhn had declared it to be a fake. However, if you follow that thread on that forum you mentioned, Dan Erlwine (the famous luthier and repairman) stated that he believed that particular guitar was a genuine Moderne. The reason the neck was different was because the owner had sent it back to the Gibson factory in the 60s to be re-fitted with a Melody Maker neck. Reason? He played his friend's Melody Maker and liked that neck!!! Accordingly to Tom Wheeler, (at the time the book was published) it belonged to a Japanese Industrialist collector and my guess is that Ibanez took the design from there. There has been a rumour circulating around for a while that Billy Gibbons of ZZ Top owns the second Moderne but in poor condition. So far he is not talking. I don�t buy the Melody Maker neck story. The 83� Gibson model I had was very temperamental with its tuning. Too many string trees and temperature changes would upset it most of the time. Let�s look at it objectively. If the original "escaped" Moderns had strange headstock designs then it is quite possible that there were huge tuning problems with the guitar. So, for a harried owner with continuous tuning problems a neck replacement would make sense. In reality, if you had a guitar that would not stay in tune no matter what you did to resolve it, would you go as far as changing the whole neck? I think I would sell it and find something else to play. Then again, it's easy to fit replacement Gibson necks onto bogus bodies and make up some weird half believable story about how it got there. For example, in the mid to late 70�s an unmentionable so called luthier was removing necks from readily available and cheap 59�/60� ES330�s and fitting them on to Bogus Les Paul bodies. This expert bodge would become almost authentic by fitting a fingerboard from a broken Les Paul SG standard and then completed by tarting up the headstock. Back then, old parts were cheap and could be salvaged from the SG�s, 330�s and other cheaper Gibbo�s from the same era. Once completed, the whole thing was passed off as a 59'/60� Burst! Plenty were fooled I can tell you. I agree that Ibanez took the design from that picture and in my view without researching what the real headstock looked like. A �literal� copy in the true sense of the word if you like. Then again, maybe Ibanez did make the guitar with the original headstock design and couldn�t keep it in tune so they plumped for the regular look. I still reckon that the Industrialist guitar was a fake and if the Reverend Gibbons has one, well I�ll eat my Moderne! Come on Billy, prove me wrong! As far as Melody Makers go, they do have great necks and even though they are made from Honduras mahogany with Brazilian boards they are still pretty cheap little guitars &#61514;. I have to say that your arguments are pretty convincing. It only leads me to one conclusion - the mystery deepens!!! Been thinking about the Melody Maker neck change thing again. I kinda understand it because as late 50's early 60's MM necks are very wide at the nut and 12th fret so slightly different from other models built at the same time. Trouble is, even if the guy did prefer the Melody Maker neck which is possible, I just can't see why anyone would go to that much trouble. Especially back in those days. I can understand it more if it was a Fender because it's so easy to do but on a fixed neck guitar it's a lot of work. Anyway, even though the nut is wide on a MM, the actual headstock on a MM is very narrow across the machine head area. The headstock on the "Industrial" Moderne looks pretty stock Gibson to me say like a Les Paul. Have you seen the artist's pre-production drawings of the Moderne and Futura (later re-named the Explorer) in 'Gibson 100 Years Of An American Icon' by Walter Cater (who has co-authored a number of books with George Gruhn)? Details are quite a bit different from the Gibson reissue. Best of all a note on the drawing specifies poplar for the Moderne rather than Korina! No I haven't seen those drawings. What does the headstock look like? Scanned these from a Gibson collectors book. Hope it helps. Thank's for posting that up Steve. The Antoria is identical to my Moderne. Drat! That grey swivel chair was very comfy but my ex wife insisted that she kept it because the Cat liked it too! Is it my eyes or are the pups closer together on the Epiphone compared to my old Gibbo Moderne? Still Reckon the Ibanez/Antoria version looks a lot more tatsy. Hmm... I see the same thing. More gap between the bridge pickup and bridge for sure. Veddy interesting! re. moderne drawing in Walter Carter book:pickguard mounted pickup, three knobs along lower bout (as on Gibson reissue) toggle switch on lower horn - however remember this is just a sketch. Headstock as on Gibson reissue. 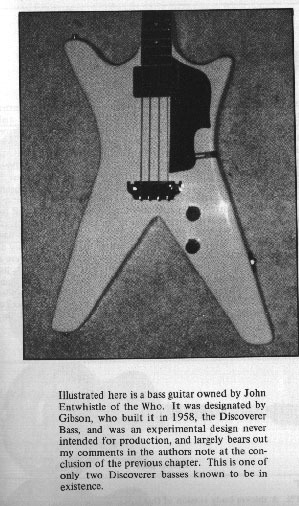 The same sketch and the Explorer bass pic above appears in Sid Bishop's book "The Gibson Guitar from 1950". That book was released by Sid in the mid 70's and must be blamed for my addiction to Gibson guitars too. Thanks Sid, wherever you are. Hope you are enjoying your Moderne. That's a great guitar. I have the Sid Bishop book too and unless yours is a later edition, that's not the same pic. This is completely different, more of an artist's sketch than a scale drawing. It shows a large pickguard surrounding a single pickup (of which only the polepieces are visible), three controls along the lower edge and a toggle switch on the lower horn. 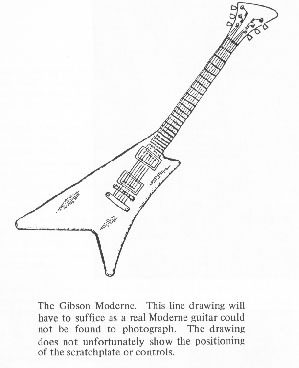 there's also a similar sketch of the Explorer with split V headstock. I've not seen these drawings in any other publication. This is where I got my pictures from. Is Ian Courtney aka Sid? I C Bishop and Sid are one and the same. 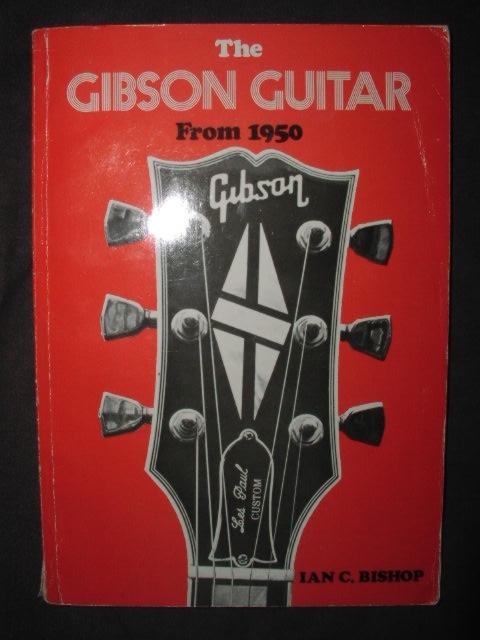 The Gibson book was a bit of a pioneering effort being one of the very first guitar books to be published. Unfortunately it contains more than its fair share of errors (understandable allowing for the fact that the vintage guitar market was then in its infancy). The book took a lot of flak from vintage experts including George Gruhn at the time of publication. If I remember correctly Sid used to work in (manage?) one of London's guitar shops (possibly Top Gear) back in the 70's and was always ready to share his knowledge of old guitars which for the time was considerable. Top bloke if you ask me. Sid was a top bloke indeed. Treated you like a human being. The cruds working the West End guitar shops these days - I wouldn't P-ss on them if they were on fire! This is the Gibson Moderne that I mentioned in the posting above that could be the real thing. By the way, this is probably the only place I have seen all possible versions of the Moderne on display so far. Well that isn't a Melody Maker headstock. Too wide for that. etc, etc but not a MM. Pity we can't see the headstock rake. If it's 50's or up to mid/late(ish) 60's, then it will be 17/18 degrees. I don't know about you guys but it looks a little shallow to me. More like 14 degrees (Ibanez)! It would be nice to know when this picture of the "Gibson" Moderne was taken. I think it would be very "coincidental" if the first Moderne picture did not show up until the mid-seventies; after all: books about the important big American guitar brands were published long before. If this guitar is a real genuine Gibson I'm sure there must have been a book that featured this rare model way before the seventies copy era. Think: let's presume there was a Moderne (or a couple of Modernes) made in 1958, would it take until -let's say- 1975 before even one picture shows up? If this picture was taken in the mid seventies than I'd say it's most likely an Ibanez (Antoria, Greco?) 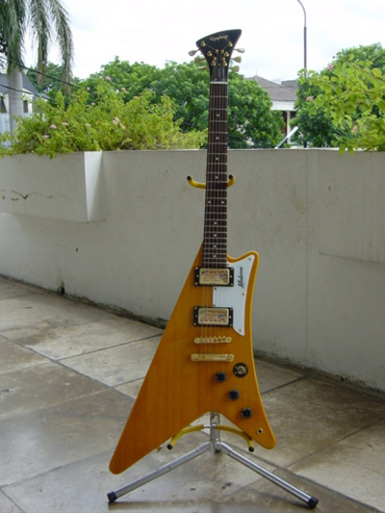 copy (first badges made in 1974/early 1975, without serial numbers and with the "open book" headstock) that was fitted with a fake Gibson logo. I'm siding with Harry. Why does the "fake" Gibson look just like the "original" Ibanez/Antoria and not closer to what Gibson knew about the prototype? After all, Gibson did make a reissue that is considerably different than what Ibanez created on their own. The Melody Maker story sounds hokey to me. The MM I owned had a narrow headstock with absolutely straight sides. OTOH, over the years there were different MM body styles (and I believe scale sizes), so maybe there was an MM with a headstock shape that had some slight curves to it. What would the original Moderne be made of? Korina, Mahogany or Ash? I've never seen an Ibanez copy made of anything other than Ash. You're thoughts are spot on I'd say. I'm glad you previously owned a MM. That way it's easy to spot that because of the headstock, that is no way a MM neck. The Wheeler book; I have it too. About 1974 yes and as Harry stated about the same time as Ibanez made the Moderne replica. The "Guitar Book" was published in 1974 meaning that the pic itself would probably have been taken much earlier than that. In the pic above there is a mention probably of a credit to "Guitar Player" meaning that the guitar could probably have appeared in that publication earlier. Tom Wheeler was the editor or at least working at Guitar Player then. This makes that pic at least one to two years before 1974. Ibanez only launched the Moderne copy in 1974 or 75 unless of course during the preparation of the prototype, somehow this slipped out and appeared as the Japanese Industrialist Moderne? Wish there was more information on that particular Moderne. Persons or parties that may shed some light on this will be George Gruhn, Dan Erlewine (who used to work at Gibson), Billy Gibbons (Six, I know what you are going to say!) and of course Gibson. What is interesting to me is that I beleive that it is the basis of these three shapes that spawned a whole sub industry of its own when Ibanez launched the copies then the Iceman, Destroyer and X series etc, not to mention the other brands like Deans, Hamers and Arias etc. Variations and mutants have appeared from other brands (some very successfully) over the years and yet ironically Gibson is still only producing the same three basic shapes! Talking about the three basic shapes from Gibson, during the prototype stage several different shapes were experimented before they decided on the three basic ones. There is supposedly an additional fourth shape, the "Thunderbolt". I have a pic of it which I will scan and share later today. 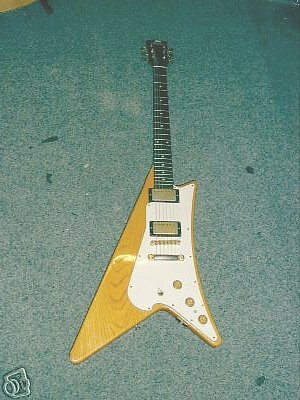 The Thunderbolt ( a Flying V in which one 'leg' of the V was attached facing upwards) was the result of an April fool gag by the UK's 'The Guitar Magazine'. A mock up was built and a 'serious' feature written up. I still have the original mag around somewhere. The thing backfired when many reader's took it seriously including those who should have known better! The guitar even got a mention in Duchossoir's Gibson book (where it was described as a possible prototype). Red faces all round! I believe that it later resurfaced in the States, now fully functional. Billy Gibbons claims to own a Thunderbolt (a name dreamed up by the mag). The same guitar? There's a moral in the story somewhere! For those who are interested the mag in question is vol 1, issue 12 of 'The Guitar Magazine' April 92. The feature, which was written by Richard Chapman and Dave Burrluck, is on page 70. The clue is in the auction date of 'April 1st'. Though the mag later confirmed that the whole thing was a hoax the 'Thunderbolt' still gets the occasional mention proving that for many prefer myth is preferable to fact! If the guitar still exists I wonder how many times it has changed hands and for how much? Billy's got a Thunderbolt .....right. Great player..big mouth. I remember that article Paul. Think it got me going until the next issue! "Gibson is still only producing the same three basic shapes!" Yup, and they are still "trying" to produce authentic looking 59' Les Pauls too. I was going to spring this little joke but you have got a very good memory. Have to admit I bought that mag because of this "Thunderbolt" article and was fooled by it too. The last sentence said "the Thunderbolt will come up for sale in a major London auction house on wednesday, 1st April" (that was in 1992). Imagine the number of people being fooled. I think it was a very good joke and not a bad design either!!! This is the pic and not the best scan as the guitar was spread over 2 pages and unfortunately the tail end is cut off. I am sure you get the idea. I know you're unlikely to say how much you blagged your Moderne for...but how much would you personally offer the guy for the Antoria version that didn't sell recently? For me, the old rule of thumb with Antoria is roughly half the price of an Ibanez for starters. So you're looking at about £300 (If it's got a case). I didn't pay quite double that for my guitar but it was close. Are you gonna make him an offer? Thinking about it...but I'm really gonna have to start selling off a few items to make room! ....If Antorias are basically the same guitar for half the price it might be a good idea to get into collecting them now.....I saw a Custom Agent go for £500 a few months back!!! An Antoria CA for £500 was a little expensive. A Summerfield rep told me back in the late 70's that the Antoria range came off the same machines as Ibanez but were re-badged for FCN or JT Coppock (can't remember which one now) in the UK. It used to piss him off because they sold that range for less than Summerfield were marking the Ibanez range up for. However, he added that the Antoria range were made up of 'lower grade' materials and 'off cuts' but most of the hardware was the same. It could have been sour grapes on his part but I have owned a few Antoria's and there definately seems to be less grain matching of timbers on these guitars. So, I guess it's possible that when guitars were put together in the factory, those destined for the Ibanez badge were a little nicer looking and those that looked a little 'bitsa' were badged Antoria. You'll also notice that the pups only have a number stamp on the bottom and are not designated 'Super 70's'. Same pickup though. Yeah, it looks very nice. I wonder if the hardware has been replated? Can someone explain to me the reasoning behind a "Private Bidder" auction? That Moderne copy was so clean! Looked really perfect except I don't like the guitar that much I guess. Sometimes on high ticket items I use a private auction because people have been known to email your bidders to offer them the same item for less during the auction! Even after the auction. In the latest book on the collection of Entwhistle, it is confirmed that the Discovery bass is a fake. It is pictured together with a fake Flying V.
Agreed. Is it worth it...Don't see these often. Looks like a few bits and bobs have been lost or taken off. Maybe worth a punt. Unfortunately, not at that starting price. Thank you for supporting Ibanez Collectors Forum. Please help your favorite Ibanez guitar site as we endeavor to bring you the latest information about Ibanez custom vintage electric and acoustic guitars. Here you can discuss ibanez, guitars, ibanez guitars, basses, acoustics, acoustic, mandolins, electric guitar, electric bass, amplifiers, effect pedals, tuners, picks, pickups.